There’s a subtle difference between a forest garden and a food forest and that’s a matter of intent; it depends on what it is you are aiming to achieve with your forest. People who love food, and they are legion, will title their fruitful garden a food forest and fill it with plants that produce leaves, stems, fruits, roots and everything else that can be served up on a plate, tastefully arranged, garnished and decorated with edible flowers or grated this or that. The epicure’s version of the sort of garden I’ve grown would be different, not only in purpose but also in looks. The food forests I’ve visited have all been more intensely managed than my rambunctious forest garden and their plate-ready produce a wonder to behold. I’ve watched the children of one food forester browse their way through their backyard, nibbling constantly on parsley, lettuce, carrots and kale in the same way less fortunate children might like to sample sugary treats at a chocolate factory. They even stripped a Brussels sprout plant of its small green globes and ate those there and then, raw and crunchy. That’s not something you see every day. My garden is shaped more by my love of plants for their own sake, than for what they can provide to feed me, and in this I differ a little from others in the forest gardening movement. So long as I can find something to eat beneath the canopy that stretches across my garden, I’m satisfied. That said, my garden is very productive and more fruitful than I can manage. In autumn, ripe fruit falls from the pear, apple and plum trees in such volumes that I’m unable to harvest it all and have to abandon a percentage of my crops to the birds and the creatures of the soil that welcome the sugars of those fruits. And that fruitfulness is increasing quickly. As each of the fruit trees matures, its crop grows in volume. That applies to the varieties that are common to our region, along with those that are both slightly unusual and very rare in Southland; Chilean wineberry, Chinese hawthorn, Himalayan Strawberry and so on. With the increasing heaviness of crop and the need not to be too wasteful, we’ve learned novel ways to preserve what food our forest provides, the most popular of those methods being the brewing of ciders from the apples and pears, from which sparkling perry can be made. Our few demijohns with their airlocks bubbling sit over autumn on the kitchen table, and produce as much cider, or apple cider vinegar, as we can possibly use. More exotic fruits, such as the orange Chinese Dogwood berries and Guelder Rose fruits are combined in jams and jellies to capture their unusual tastes and fragrances. There are others, such as the huge haws that decorate the Chinese Hawthorn that are best dried and chewed-upon through the winter. Odd-bod fruits such as those that hang from the branches of the medlar, require bletting; rotting for the un-initiated, and eating with a spoon and a hearty dollop of cream. Their over-ripe figgy taste is an acquired one, but familiar to fruit lovers from past centuries. Quinces have to be cooked before they can be processed into butter, crab-apples have to be boiled and drip drained through cloth into a bowl then reboiled until they set to jelly. Many of the fruits we grow are out of the ordinary and have to be eased into our traditional Kiwi diets gently, but that’s part of the allure of finding and growing something different from the usual; a new discovery that pleases our eye might also please our taste buds. We are not frutarians, of course, and gather and eat the edible parts of almost everything that grows in our forest garden; the pearly-white roots of the daikon radish, knobbly Jerusalem artichoke tubers and the finer Chinese artichoke, juicy stems from the umbelliferous alexander and cardoon, the seeds of sweet cicely, fennel, peas, beans and corn, flowers of evening primrose and daylily. There are even plant-parts that we eat that defy description. The tasty bits of the Japanese raisin tree are not in the slightest like the dried fruits you might imagine, but more a swollen, forked stem. All up, despite my not planting with the kitchen in mind, there’s no question that we eat well from our forest. Just had an idea. Thinking about bees and their united and collective behaviour for the good of the hive. Ants too are very busy in that way but are not as positive, more users and thieves of food, not so much an aid to the food of the world as bees are. I think that bees have a lifestyle that we need to adopt so that we get away from ant-like behaviour. I suggest that we adopt a new greeting that people will use to establish their standing for a caring society. Instead of saying Hello or Hi we will say Buzz, and it will also be used for goodbye. It will be like Kia Ora in Maori, saying goodbye in Italian Ciao. But this will be a greeting for the aware and future oriented people who want to know the standing of who they are talking to, what group they commit to, like a transparent Mason’s handshake. People who want to make changes in themselves and society to help the good, practical, humane society we need to grow to the vast majority of people instead of a large minority have to coalesce. So buzz Robert. Have a good day. Thanks for this instalment of Food for the Mind. And try it out on people. They will laugh, and be intrigued. Tell them to do the same to others and have a little explanation in mind of why they say it. I haven’t thought of a short sentence that does that and it will be needed. So if you could come up with one I would appreciate it. This thing will spread, become a topic for discussion, and every time it is said will remind the people concerned about the important topics of the day. It will be the in thing! I did feel for the ants though. Their role in the wild world is as pivotal as the bees’, I’m betting but I take your meaning. There’s a famous work by a revered writer/philosopher whose name escapes me presently, on bees and the model they offer to mankind. He urges us to shape our communities around that of the bees, though is sounds pretty prescriptive at first hearing; freedom of thought and action and all that. It does seem that we humans have adopted a parasitic model for our recent development; one that isn’t especially symbiotic and looks to be exhausting its/our host. That model is a closed one and needs to be quickly shed if we are to continue as a species in any significant number; poisoning the host with unnecessary waste is not the action of a successful organism, imho. You didn’t come up with an explanatory sentence as I asked at the end. So think about it during the day will you and let me know. Buzz. There’s also the bees’ “humm” (Not unlike the Hindu “Om” used in meditation and yoga). As in, “Things are humming along well”. Perhaps, “be unto the bee”? No too enigmatic. Needs to be simple explanation. I just want to say a massive “Thank you!” for this series of posts. I haven’t found time to comment but I draw strength and calmness from reading these. I am very lucky to live in a quiet rural area where I wake to the sound of tuis arguing, and call out “‘Morning!” when the kereru flies past; when my arguments at night are with the lone possum that has so far eluded the trappers and slips in through the window if given half a chance. Across the valley, wekas call at night, as do peafowl in the evenings. Occasionally when I wake, deer have come down to the stream. It is all that that keeps me sane in a world that seems to be wobbling on its axis, and at times threatens to spin out of orbit. Anyway, “Thanks”. You are most welcome, Manuka AOR. You are fortunate indeed, to live in such a place as you describe. I’d be having to change my ways a bit if I lived in a similar situation to you; possums can create anguish where fruit trees are valued highly, as can kereru, especially during the fruit-set and bud-burst periods. I have some resident kereru but my resource can absorb their actions without showing signs of harm, so I am able to enjoy their presence. Weka would be a challenge, I’m thinking, as I have many ground or low fruiting shrubs, as well as perennial vegetables that they’d doubtless enjoy. My hens approximate weka but are gentle by comparison, I guess. Guinea fowl, even from a distance, get on my nerves; it’s that squeaky door sound the make ad nauseum 🙂 As to that wobbly orbit, it pays to be nimble to stay up-right; adroit of body and mind and so I thank you for your supportive comments, manuka. Kākāpō and kōkako too. If we could only attract back from extinction, huia…moa! Now there’s a bird that would impact upon a person’s forest garden! Just a question, do you plant by the moon at all? Apart from any other moon induced response, it would seem a good idea – planting by full moon. The light would be sufficient to locate area, with a lantern highlighting your immediate site, and then the plants would be influenced by the low light and start drawing through their roots and have 8 hours or so to recover. That’s an interesting comment, greywarshark. I’ve read that cultivating and planting during the night means fewer weed seeds strike. I’m not sure about the idea, but just sayin’, someone’s claimed it. I do plant by the moon, on occasion. I have to really, being the author of the moon calendar published monthly in the NZ Gardener magazine 🙂 I have mixed feelings about the practice and like to remain open to discussions about planting by the moon. Most especially, I’m interested to hear from people who are applying the calendar, be that a simple one or more complex, like that of the biodynamicists. I’m looking forward to the Super Moon – I hope the skies are clear and that there is a discernible difference to the eye. I hope the skies are clear and that there is a discernible difference to the eye. There is a difference already where I am – With still couple of days to go, it already seems as bright at night as during some other completely full moons. Also, and I apologise if you have already covered this, but I’m wondering about growing Kawakawa. Is it easy to get going? I’ve just got some to use as a tea. I’m growing it here, Manuka AOR, but it’s a challenge in my southern climes. Cold weather in wintertime knocks it back, though it recovers every spring. I rate it highly as a tonic tea, to be taken daily. I don’t know where you are but if you’re north of me, you should be able to grow it with ease, unless you are frost-prone. It grows easily from seed, which you can buy online, but collecting it is simple and it’s easy to post in an envelope. Down here, it doesn’t get holey, the way it does further north; the caterpillar doesn’t live here (yet). I’m in the Bay of Plenty, at highish altitude. Heavy frosts in winter, though brief – looks like snow (breathtakingly beautiful). Rest of the year it is mild to warm to quite hot in summer. I might try it next year and cover if necessary during the frosts, if possible. Its an understorey plant in the wild so you could plant it underneath a large tree to give it some shelter. Or keep it in a pot for a couple of years to make sure you have the right location first. Mine are under the skirts of my native riparian “grove”, mauī and look great there but they’re not quite sheltered enough when there are more than a couple of frosty days in a row. The flowers are charming. Tasty too, I’m told. Thanks Maui, might try that. A few years ago I had to relocate from a nice bush block to suburbia. Your posts bring back wonderful memories! while I was not at your level, it was getting back close to nature that helped after a hard day. I have brought a few plants with my move to suburbia, some of my favourites are Guava and Cape Gooseberry’s the kids (and birds) love them. I’m glad, Chuck. Cape gooseberries are also a favourite of mine; such a curious taste and they’re part of the nightshade family (tomatoes, potatoes etc.) that suit some and not others. There’s a beauty about their flowers, even the those of the potatoes, which are surprisingly various. We grow about 30 different, old-style varieties, my favourite being kowiniwini, with le ratte coming in a close second. This is what you shall do; Love the earth and sun and the animals, despise riches, give alms to every one that asks, stand up for the stupid and crazy, devote your income and labor to others, hate tyrants, argue not concerning God, have patience and indulgence toward the people, take off your hat to nothing known or unknown or to any man or number of men, go freely with powerful uneducated persons and with the young and with the mothers of families, read these leaves in the open air every season of every year of your life, re-examine all you have been told at school or church or in any book, dismiss whatever insults your own soul, and your very flesh shall be a great poem and have the richest fluency not only in its words but in the silent lines of its lips and face and between the lashes of your eyes and in every motion and joint of your body…. Goosebumps all over, and tears. I don’t know why. How do words on a page do that? Oh OH so many questions from your post Robert Guyton. 1. Do you have a wart growing for the apple cider vinegar? Or are you grabbing a new one each year from the sediment of the previous year? 2.Have you ever had Jerusalem artichoke chips? Pan fried in a mix of butter and olive oil, just heaven. Add a touch of salt, it goes so well with a fresh salad. 3. Cider, as in non-alcoholic? 4. Do preserve some of the fruits whole? 5. Do you make relishes and pickles? Hi, Adam. 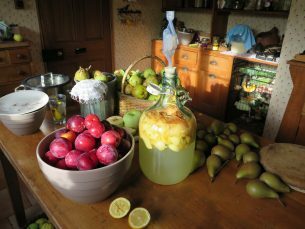 I’m not the best cider maker around but mine’s good enough for me and I’ve gallons of the stuff – far from non-alcoholic it is too. I don’t know how you’d do one that didn’t have alcohol, as the process involves the conversion of fruit sugars into alcohol by the yeasts that arrive in the mixture on the skins of the apples. My cider vinegar, and that is very good, I would say; clear and pleasant to taste (when mixed with rainwater – too strong to drink straight and tough on tooth enamel), results from the random arrival, from the air, of the particular yeasts that turn cider into vinegar. Washing the bottles from the previous year only casually would transfer the vinegar yeasts, I expect. I employ the same practice as I do with plant pots – a quick rinse and she’ll be right. I like to keep the microbe populations alive, rather than sterilize the life out of my world. I do clean the cider gear well though, but only with water. When I see what I’ve written there, I think it’s amazing I can produce anything other than vinegar, but I do! Preserving fruits “whole” – we store apples, wrapped in tissue and separated by pressed paper-pulp dividers, in boxes, in a space that cool. Plums we bottle. Pears we slice and bottle. Freshly picked apricots don’t get past the mouth. Quinces I freeze. Medlar I eat straight away. Our excess berry fruits (red, black, white currants, gooseberries of all stripes, worsterberries, blueberries, cranberries, Chilean wineberries, etc. become jam or get frozen. Chinese hawthorn and some apples I dehydrate and store in jars. I don’t do relishes and pickles but I trade with those who do. I’ve not yet eaten jerusalem artichoke chips but will do now, thanks, adam. Have you tried raw Chinese artichokes? Crunchy and tasty. Following on from one of your earlier posts, have randomly stuck the apple tree prunings around the property and have been rewarded with small leaves. Will mulch and watch. I really enjoy reading your Sunday posts, Robert. A calming end to the week. Molly – I’ve tried the same here this year – 300 of them in fact and each from a different “heritage” tree growing in the region. It was a big task; keeping track of what came from where, but the labeling’s on and they are in the soil. I’ve no idea whether it will work, but your results encourage me, thanks. I’m really pleased that you enjoy these posts, Molly. If I’d not got any positive feedback, I’d be a little anxious about the value of my efforts; I think we are all like that, aren’t we; needing encouragement from our peers? As to them being calming, I like that and wonder if you’ve ever read a children’s story called “Valerian Hare”? It’s gorgeously subtle and features a peaced-out hare , tormented in his town by the coarser animals for his calmness and composure, who saves the good burghers from a rampaging stag, by calming it with a gesture of non-aggression, seated cross-legged on the main street as the wild thing careened about, creating chaos. Valerian Hare became the toast of the town, though he showed no signs of change in his demeanor. Eventually the townsfolk went back to tormenting him, once the excitement of the event wore off or was forgotten. Valerian remained clam throughout. Beautiful story, that. I wish I could find it again. It was written by a European man, possibly Polish. Quirky as. You mentioning the story of Valerian Hare with good attitudes, and an unshakeable calm is interesting. It may be a poor psycholigical ploy in real life, as well as the story, as the hare might have had a tipping point to make a change in attitudes of the towns animals. People who don’t get passionate in any way lack something. Finding a position just off balance, but not too far, is I think the meaning of life and a life’s work. I’m going to search that one out, greywarshark, thanks. Further to my reference to Valerian Hare, I recall a poem in another book by the same author (Janesh?) where he writes a short poem titled, “April showers” and illustrates it with a little pig, peeing on the flowers, but subtly, so you (or the child reading) would not notice. Very cute. You’re a wag. You bring fun to the blog along with the serious and practical stuff. Firstly, hope all is well with you and yours after the quakes last night. Just read your reply Robert, and will have a look for the story, but it an interesting premise. Talking with an old friend last night and today, whose job is to act as a change facilitator for Health providers in Australia. We are having a lot of conversations about how to approach the fear based views of others with an intent to enter into genuine dialogue. She stated the need for a non-partisan (preferably two) facilitator to work with every group, and that the concerns of some manifest in aggressive ways when you endeavour to give equal voice to all members. Interesting parallel with your story. I thought this on Radionz sounded klike a promising discourse on relationships communication gaining understanding, persuasion to open minds etc. How do you stop smart people from doing dumb things? Our guest says ‘workplaces encourage smart people to not use their brains’… and so he’s created what he calls ‘pop-up philosophy’. And all it takes is a deck chair. Andre Spicer is professor of organisational behaviour and the founding director of ETHOS: The Centre for Responsible Enterprise at Cass Business School, City University of London. He is an expert in the areas of organisational behaviour, leadership and corporate social responsibility. That’s interesting to think about, Molly. A people-whisperer is what you’d need to be. Those spooked colts respond amazingly to the subtle movements of the horse-whisperer and humans are creatures too. “I’m unable to harvest it all and have to abandon a percentage of my crop to the birds and creatures of the soil” How about cooperating with other human beings to gather that percentage of your crop and give, trade or sell it ? Don’t take that tone with us you superior twit. You mention co-operation and actions that actually are the basis of approach of people who regularly write on TS, and certainly underlies what Robert and his wife do. If you had any idea of true community spirit you would know that. But you sound as if you fall into the role of being the prating outsider jumping to criticise and condemn, judgmental and negative. Go on prove me wrong, tell me about your warm and generous side where you do lots of things for others who are struggling, helping them with things they need, going out of your way to be kind in a regular fashion, advocating for more humane treatment of all citizens bottom up. Living with others in as friendly and helpful a fashion as is possible, not making cutting comments based on your own skewed life outlook. Tone, eh! Hard to discern sometimes and easy to mistake. I enjoy the sort of approach taken by Red Hand; it’s sassy and I’m mindful of the fact that he/she read the post and took the time to respond. I’d engage with Red Hand any day around his/her question and anything else he/she might want to say or know. His/her idea of “cooperating with other human beings” is spot on, imo. Great response Robert and a good point I’ll remember. Red Hand is engaging and that’s far better than apathy so I guess look on the practical side. Always look on the bright side of life is your motto I think Robert. I too have a Guava garden. Some part of the yield is left to parrots and squirrels. Even more, birds and animals are more thankful than humans. What location is your garden in Deva? I guess not in NZ as we don’t have squirrels here – they haven’t found their way through our biosecurity borders yet I think. Quite right, Red Hand and in fact, I do. All manner of friend and visitor harvest while they are here and my parents-in-law come at the same time every year to pick currants and gooseberries which are transformed by them into perhaps the world’s best jams. A percentage of our apple crop goes to the organic cooperative in the town and another sizable load goes on display at the Harvest Festival and is given away to people who attend. Last year, an elderly woman found an apple whose name she remembered from her childhood and when we pressed her to taste it, despite her not wanting to impose, she burst into tears at the rush of memories that flavour brought. I have two other ‘wild’ orchards in this village, both of which are open to visitors who are welcome to take all they can carry in their hands whenever they visit. Humans do much better from my orchards than birds or worms do, but still I’m happy that some cycles back through the wild creatures.